The beautiful tart above was developed and styled by our friend Jesse Szewczyk. He is a graduate from the Culinary Institute of America and produced this tart and image for us exclusively with photographer Sara Walsh. Read our full interview with Jesse to learn more about his approach to food, food styling and photography. 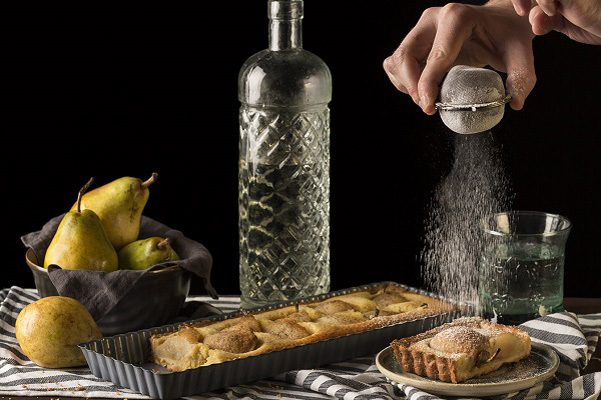 This tart features seckel pears but other pears can be used, which Jesse explains in our chat. The rectangular shape is somewhat unexpected but showcases the round fruit so nicely. 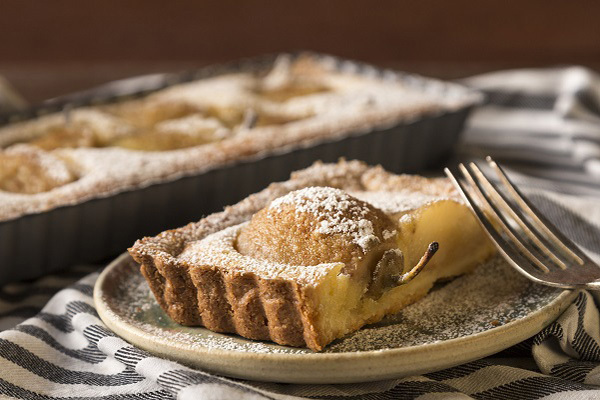 The pears are nestled in an almond frangipane filling. To make the crust combine sugar, salt, flour and butter in the bowl of a food processor. Blitz until the butter combines with the dry mixture and resembles wet sand. Add egg and blitz just until combined. Roll dough onto a floured surface and roll into a 6x16 inch rectangle shape. Place in 4x14 inch rectangular tart pan and trim the excess dough from the edges. Place in refrigerator for at least one hour. To poach the pears combine water, sugar, cinnamon sticks, vanilla bean and cloves in a medium sized sauce pot. Bring to a simmer and add halved pears. Poach pears in simmering mixture for about 3 minutes until they are tender. Remove pears from poaching liquid and set aside. To make the frangipane filling place almond meal, sugar, egg, butter, vanilla extract and flour in the bowl of a food processor. Process mixture until it is completely smooth and silky. Reserve. To assemble the tart place frangipane filling in the bottom of the chilled tart shell. Place poached pear halves in the filling and bake for 30 minutes until the tart is golden and fragrant.